Well Bees fans tonight is the night I expect to see a packed house here at Community Field. It is win or go home time for YOUR Burlington Bees. The Bees (1-1) and Kane County Cougars (1-1) square off in game three of the first round of the playoffs and what is going to be the final game of the 2011 season for one of the two squads. The winner of tonight’s game faces the Quad Cities River Bandits in the Western Division Championship, which starts on Saturday. It’s also “Big Fun Friday” here at Community Field and you can enjoy 16 oz. cans of Bud Light and Busch Light for just $3.25. If YOUR Bees win tonight they will play host to the River Bandits tomorrow night at 6:30 p.m. with the gates opening up at 5:30 p.m.
RHP Jason Adam (6-9, 4.23) toes the rubber for the Kane County Cougars tonight. Adam last pitched against Clinton on September 3 and allowed two earned runs on five hits over four innings pitched. He has an overall record of 1-1 with a 6.35 ERA against the Bees this season. He last pitched against the Bees on July 10 and allowed four earned runs on seven hits in five innings of work. He allowed four earned runs on five hits in 6.1 innings against Burlington back on June 14. RHP Jose Macias (8-4, 3.46) takes to the hill for the Bees tonight in this win or go home match-up. He last pitched against Cedar Rapids on September 5 and allowed one run on three hits in three innings. Macias has an overall record of 1-0 with a 7.20 ERA against the Cougars this season. In his only appearance against Kane County, he allowed four earned runs on nine hits in five innings of action and earned the win. In case you wondered here is how tonight’s starting lineup for YOUR Bees have fared against the Cougars this season. YOUR Bees scored four runs in the third inning to earn a 5-1 win over the Kane County Cougars in game two of the opening round of the playoffs on Thursday. The Cougars opened the scoring with a run in the third inning. 2B Angel Franco (1-4) hit a solo home run over the right field wall for a 1-0 lead. The Bees responded with an eight-batter third inning. SS Yordy Cabrera (0-2) walked and went to second base on a single by 2B Nino Leyja (2-4). RF Jose Crisotomo (1-4) followed with an RBI single to score Cabrera for a 1-1 tie. Crisotomo moved to second base on the throw and Leyja ended up at third base. DH Josh Whitaker (1-2) and 1B A.J. Kirby-Jones (3-4) followed with back-to-back RBI singles and 3B Tony Thompson (1-3) hit a sacrifice fly to right field to make it 4-1 Burlington. The Bees got an insurance run in the eighth inning. Whitaker walked and went to second base on a single by Kirby-Jones. C Beau Taylor (1-3) walked to load the bases. CF Douglas Landaeta (0-3) hit a sacrifice fly to right field to score Whitaker for a 5-1 lead. For those of you in attendance at tonight’s game be sure to wish RHP Josh Bowman a Happy 23rd Birthday. Bowman allowed one run on two hits over six innings last night and earned the win. RHP Zach Thornton was added to the Bees from AA Midland before the game yesterday and allowed one hit and struck out one in an inning of work last night. To make room for Thornton, LHP Max Peterson was sent to the AZL A’s. The Burlington Bees continue their playoff series with the Kane County Cougars this evening. It’s do-or-die for the Bees as they need a win to force a game three in the best-of-three first round playoff series. The pitching match-up on paper seems to be favorable for the Bees. RHP Yordano Ventura toes the rubber for the Kane County Cougars tonight. Ventura last pitched against Cedar Rapids on September 2 in Cedar Rapids and allowed one earned run on four hits over five innings pitched. He has not fared well this year against Burlington, with a 0-1 record and a 12.27 ERA in two starts. He pitched in Burlington on June 29 and allowed six earned runs on seven hits over three innings pitched. He allowed four earned runs on seven hits in four and one-thirds innings pitched in Kane County on July 9. Ventura is 4-6 with a 4.27 ERA in 2011. RHP Josh Bowman gets the start for the Burlington Bees in game two tonight. He pitched two scoreless innings in a start against Cedar Rapids on September 4 in his final “tune up” before the playoffs. Bowman’s last start against Kane County was a loss back on July 11. He allowed six earned runs on 10 hits in six and one-thirds innings pitched at Elfstrom Stadium. He is 8-6 with a 3.55 ERA in 2011. After literally months of anticipation since the Bees clinched the first half Western Division crown in late June, the day is finally here. I’m just a few hours away from broadcasting game one of the 2011 Midwest League Playoffs here at Elfstrom Stadium in Geneva, IL between the Bees and the Kane County Cougars. Tonight’s first game should give us a tremendous pitching match-up. RHP Blake Hassebrock will get the start for Burlington against RHP Greg Billo for Kane County. Hassebrock is coming off a start against Wisconsin where he allowed one earned run on four hits over five innings pitched. The High Point, NC resident has plenty of work against Kane County this season, logging a 1-1 record with a 1.47 ERA over three starts. He’s allowed three earned runs on 14 hits in 18.1 innings pitched. Offensively Burlington will have its hands full against the top pitcher in the Midwest League in 2011, RHP Greg Billo. The 21-year old was 9-5 with a 1.93 ERA in 135 innings pitched. He logged 119 strikeouts and gave up 113 hits. Billo is 1-0 with a 3.00 ERA against Burlington in two starts this season. He’s surrendered three earned runs on 10 hits over nine innings pitched. With IF Tony Thompson activated for today’s game against Cedar Rapids, the Bees are fully ready for the Midwest League playoffs that begin on Wednesday. Thompson, who has not played since August 24 against Beloit, will be in the lineup for this afternoon’s regular season finale. There is not much to write about Bees wise thanks to yesterday’s game being cancelled due to the rain that hit the area. 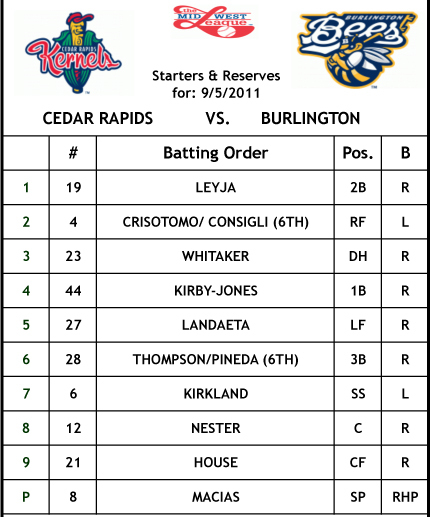 The Bees and Cedar Rapids Kernels begin their series today at 2:00 p.m. The series was originally scheduled to be three games, but will only be two now after yesterday’s game was cancelled. It’s Louisa Communications Kids Day at Community Field.” All kids 12 and under get in free (when accompanied by a paid adult) and get to run the bases after the game brought to you by Louisa Communications. It’s also “Faith Day.” All fans who bring their Church bulletin on Sunday home games (excluding Community Basket Day) get $1 off up to four general admission tickets. As far as I know, RHP Seth Fowler (3-4, 6.71) will start today for the Kernels. He was supposed to start last night. On August 29 against Wisconsin, he allowed three runs on six hits over six innings pitched to pick up the win. The Angels signed Fowler as a non-drafted free agent in 2010 and he split time last season between the AZL Angels and Orem. Bees RHP Josh Bowman (6-6, 3.60), who was supposed to start last night, will start on the bump today. His last appearance came against the Quad Cities River Bandits. He allowed four earned runs on eight hits over five innings pitched. The Bees will face Kane County in the first round of the playoffs. The Bees will travel to Geneva, Ill. and face the Cougars in the first game on Wednesday night at 6:00 p.m. The Cougars travel to Burlington on Thursday to take on the Bees, which will begin at 6:30 p.m. If the series is tied at one game a piece after Thursday then both squads will face each other in Burlington on Friday at 6:30 p.m.
Former Bee Zach Thornton was called up to AA Midland yesterday and pitched for the RockHounds last night. He allowed one hit and fanned four in three innings of work. RHP Seth Frankoff, who started five games for the Bees early in the year, allowed four hits, struck out five, walked one over six innings and earned the win for the SS-A Vermont Lake Monsters last night. OF Jose Rivero went 0-for-3 at the dish and C Juan Nunez went 0-for-1 last night. Both players were called up to Midland on Thursday, Sept. 1. In case you wondered, the RockHounds lost to Frisco 9-4. Dayton SS Billy Hamilton stole three bases including his 100th of the season as the Dragons defeated the Lansing Lugnuts 4-2 last night. Hamilton became just the 12th player in recorded MiLB history to steal 100 bases in a season. He broke the Cincinnati Reds all-time organizational record, surpassing Ramon Sambo’s 98 with the Cedar Rapids Reds in 1988. Hamilton is the first player to steal 100 bases in a season since 2001 when Chris Morris of Peoria stole a Midwest League record 111. As a club, Dayton has 223 steals this season. The record for the most stolen bases in a season by a club is 319 set by Burlington in 1980. It’s “Friends and Family Night” at Community Field tonight. Bring your family and friends, and get exciting baseball plus extra fun with theme nights, and everyone gets to run the bases after the game sponsored by KCPS AM 1150. Your Bees and the Cedar Rapids Kernels, the Midwest League affiliate of the Los Angeles Angels of Anaheim, begin their three-game series tonight at 6:30 p.m. It is the final regular season series for both teams and the final three games of the year for the Kernels, who won’t make the playoff cut. The Bees will face Kane County on Thursday, Sept. 8 in Geneva, Ill. if Clinton notches a win tonight. Like I wrote yesterday, the Cougars are more than likely going to be the Bees first round opponent in the playoffs even if Clinton loses tonight, because the second place team in the division plays the River Bandits. Clinton holds a 1.5 game lead over the Cougars for second place. I could be wrong. You never know what the baseball gods will have in store for the LumberKings and the Cougars. RHP Seth Fowler (3-4, 6.71 ERA) gets the start for the Kernels tonight. He last took the mound on August 29 against Wisconsin. He allowed three runs on six hits over six innings pitched to pick up the win. The Angels signed Fowler as a non-drafted free agent in 2010 and he split time last season between the AZL Angels and Orem. RHP Josh Bowman (8-6, 3.60) takes the mound for the Burlington Bees this evening. His last appearance came against the Quad Cities River Bandits. He allowed four earned runs on eight hits over five innings pitched. Bowman was selected by the Oakland Athletics out of the University of Tampa in the 10th round of the 2010 Major League Baseball Draft. He concluded his senior season with an 8-5 record and 3.92 ERA. In 85 innings, he notched 85 strikeouts. The hurler has taken mission trips to West Virginia, Tennessee, Puerto Rico and Mexico. The Bees defeated the Wisconsin Timber Rattlers (28-39) by a score of 7-2 Friday night. Bees RHP Drew Tyson (5-4) allowed one hit in two scoreless innings and earned the win. Bees RF Douglas Landaeta (2-4) hit a lead-off double in the bottom of the second inning and advanced to third base on a ground out by 2B Ryan Pineda (2-4). A sacrifice fly from 3B Wade Kirkland (2-3) plated Landaeta to put Burlington up 1-0. In the top of the third inning, Wisconsin RF T.J. Mittelstaedt (1-4) hit a solo home run to center field to knot the game at 1-1. Wisconsin C Rafael Neda (1-3) hit a two-out single to center field in the top of the fourth inning. With 3B Gregory Hopkins (0-3) batting, Bees RHP Blake Hassebrock threw a wild pitch and Neda advanced to second base. Hopkins reached first base on a fielding error by Bees SS Yordy Cabrera (1-4) and Neda moved to third base. With Wisconsin SS Nick Shaw (0-4) at the dish, Neda scored on a throwing error by Hassebrock to give the Timber Rattlers a 2-1 lead. In the bottom of the sixth inning, Burlington 1B A.J. Kirby Jones (2-4) hit a two-out single to center field and moved to third base on a single to right field by Landaeta. With Pineda at the dish, Landaeta stole second base. A double to center field from Pineda plated Kirby- Jones and Landaeta. Pineda scored on a double to left field from Kirkland and Burlington took a 4-2 lead. Kirby-Jones led-off the bottom of the eighth inning with a single to right field and advanced to second base on a single to left field by Pineda. Kirkland smacked a double to left field, scoring Kirby-Jones and moving Pineda to third base. A sacrifice fly to center field from C John Nester (0-1) plated Pineda and moved Kirkland to third. A single to left field by Cabrera scored Kirkland and the Bees took a 7-2 lead. Hassebrock allowed two runs on four hits and struck out six in five innings of work in a no decision. Bees RHP Blake Treinen pitched a scoreless inning and earned the hold. Burlington RHP Zach Thornton has been promoted to AA Midland effective immediately. Bees OF Jose Crisotomo has been activated from the disabled list and will be the designated hitter in tonight’s game. With the roster moves, the Bees active roster is at 24. Thornton appeared in 40 games for the Bees. He had an overall record of 5-4 with a 2.39 ERA. Crisotomo has played in 44 games and has a .333 batting average. Today is IF Yordy Cabrera’s 21st birthday. Make sure that you come out to the game tonight and wish him a Happy Birthday! Cabrera has a .182 batting average in 11 at-bats in the last five games. He has played in three out of the last five games. His luck should turn around tonight right, I mean it is his big day. He is starting at shortstop tonight and batting out of the eighth hole. IF A.J. Kirby-Jones, IF Ryan Pineda and OF Douglas Landaeta all went 2-for-4 at the dish in last night’s 7-2 win over the Timber Rattlers. IF Wade Kirkland went 2-for-3 in the victory and had three RBIs. Both the Timber Rattlers and the Bees left six runners on base last night. Don’t forget that after tonight the Bees have only three games remaining in the regular season, which are against the Cedar Rapids Kernels. The Bees begin their playoff run on Wednesday, Sept. 7 on the road against either Clinton or Kane County. At this point in time it looks like the Bees will be traveling to Geneva, as the LumberKings have a 2.5 game lead over the Cougars and the second place team in the division will face the Quad Cities River Bandits. The Burlington Bees (29-36) and Wisconsin Timber Rattlers, the Midwest League affiliate of the Milwaukee Brewers, wrap-up their three-game series on tonight at 6:30 p.m. It’s “Big Fun Friday” at Community Field. Fans can enjoy 16 oz. cans of Bud Light and Busch Light for just $3.25 sponsored by Budweiser, Today’s Hit Music Hot 97.3, and Your Hometown Station, Big Country 103.1. It is also “Iowa-Iowa St. Rivalry Night.” Fans should how their allegiance in this bitter rivalry by supporting their favorite team. RHP Jimmy Nelson gets the start for the Wisconsin Timber Rattlers tonight. He last took the mound on August 28 against Cedar Rapids. He allowed one run on five hits over seven innings pitched to pick up the win. He is 8-8 with a 4.30 ERA in 2011. Nelson entered the 2011 season as the eighth-best prospect in the Brewers organization according to Baseball America. He was selected by Milwaukee in the second round of the 2010 draft. He was originally drafted by the Cincinnati Reds in the 39th round of the 2007 draft but didn’t sign. RHP Blake Hassebrock takes the mound for the Bees this evening. His last appearance came against Beloit on August 26. He allowed four earned runs on four hits over 3.1 innings pitched. He is 7-8 with a 2.67 ERA in 2011. Hassebrock was selected in the eighth round of the 2010 draft by Oakland. He stands at six-foot-five and throws a four-seamer, two-seamer, slider and change-up. The Bees scored six runs in the fourth inning to earn a 6-3 win over the Wisconsin Timber Rattlers at Community Field on Thursday night. LF Royce Consigli (1-4) led off the sixth inning with a single and moved to second base when DH Josh Whitaker (0-2) reached on a walk. Both men scored on a single by 1B A.J. Kirby-Jones (1-4) for a 2-0 lead. RF Douglas Lanadaeta (1-4) followed with a single to move Kirby-Jones to third base. 3B Wade Kirkland (1-3) singled home Kirby-Jones for a 3-0 lead. C John Nester (1-2) followed with a two-run double. He moved to third base on a ground out by SS Yordy Cabrera (0-2) and CF Tyreace House (0-2) hit a sacrifice fly to score Nester for a 6-0 lead. RHP Jonathan Joseph (6-4) pitched six innings and allowed two runs on five hits to earn the win. RHP Pedro Vidal pitched a scoreless ninth inning to earn his fifth save of the season. Burlington C Juan Nunez and OF Jose Rivero have been promoted to AA Midland effective immediately. With the roster moves, the Bees active roster is at 24. Nunez, who was recently activated off the Disabled List on August 27, leaves Burlington with a .105 batting average in 12 games. Rivero was hitting .196 with two home runs and 22 RBIs. Jose Macias closed out a stellar month of August with seven shutout innings in the Bees 4-1 win over Wisconsin on Wednesday. Macias finished the month of August with a 5-0 record and a 1.18 ERA in six starts. He allowed just over five earned runs in 38 innings pitched and will get one more start on Labor Day against Cedar Rapids before the playoffs begin next week in either Clinton or Kane County. Speaking of playoffs, the Bees will play the second half wild card winner. Right now that would be Clinton BUT since Quad Cities already won the first half wild card, the River Bandits will play the second half division winner. To complicate things the River Bandits are leading the division so if they win the second half title, Quad Cities will play the second place team in the division, the Clinton LumberKings. That means the Bees will play the opponent with the next best record in the Western Division. Right now that is the Kane County Cougars. As you might imagine, it’s a fluid situation. Stay Tuned! With the final home stand of the season beginning tonight, the Bees have moved around their starting rotation. 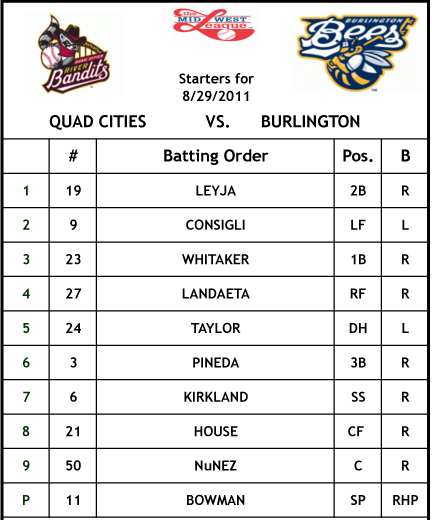 RHP Jose Macias will get the start for Burlington tonight after his start was rained out in Quad Cities on Tuesday. The Bees will be sending RHP Jonathan Joseph to the hill on Thursday and RHP Blake Hassebrock will get the start on Friday. RHP Josh Bowman will take the hill for Burlington on Saturday and RHP Nate Long pitches on Sunday. Josh Whitaker continued his amazing 2011 season by becoming the lone Bee selected as a 2011 Midwest League Post Season All-Star. A 25th round pick of the Athletics in 2010 that didn’t even break camp with the Bees out of spring training, Whitaker is currently leading the Midwest League with a .332 batting average. He’s hit for power, adding 17 home runs and 68 RBIs in his first full season out of Kennesaw State University. With both Jose Crisotomo and Tony Thompson on the Disabled List, the Bees are counting on Whitaker to produce in the MWL Playoffs next week. All indications are that he’s up to the task.